Last month saw a long-anticipated event - FurryCon, the first furry convention in Sweden since Eurofurence 2 - drawing 110 people to the city of Karlstad on the north shore of Lake Vänern. The event ran from late Friday (18 September) to Sunday afternoon. It was organized by Spots and Stripes, and run by a team of 30 volunteers led by kirrow. Alcohol was banned, as was the display (but not private sale) of adult material. 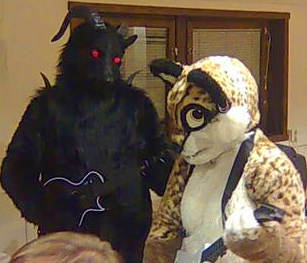 The two fursuiters were very popular, especially at the fursuit bowling outing. Also popular was the ear and tail workshop, roleplaying games, and party games such as Mafia. A large collection of video games were available; those wishing to loan them were required to leave an item of value behind. The event was a financial success, running a surplus of 4000 SEK (~US$570). 10% was donated to the event's charity, Djurskyddet Karlstad (Karlstad Animal Welfare); their total was 1181 SEK after a charity raffle and dealer contributions. Some found the furry theme lacking, but event organizers - most veterans of anime cons - pledged to address this in future years. FurryCon's future location is still uncertain, though one proposal is to move to different cities each year, starting in Stockholm. However, a competition for next year's homepage mascot has begun. The theme? "Friendship and love . . . anthro style." ↑ CabinCon (pictures ran in Töcksfors, Sweden until 2004, but it never held itself out as more than a furmeet.